Wishing you all a Wonderful Dassara. Cave One is dedicated to Shiva as the impressive Nataraja; and Devi as Mahisasuramardini. 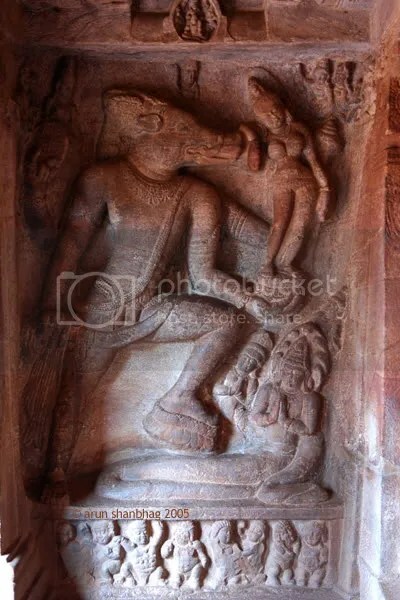 Cave Two honors Vishnu and his avataars Varaha and Vamana. Cave Three is also dedicated to Vishnu, and holds some of the most impressive works of art of his avataars Narasimha. Cave Four is dedicated to Mahavir and the 24 Tirthankaras. As you step on the front porch, the pride of place on the immediate left is taken by an imposing sculpture of Mahavir. 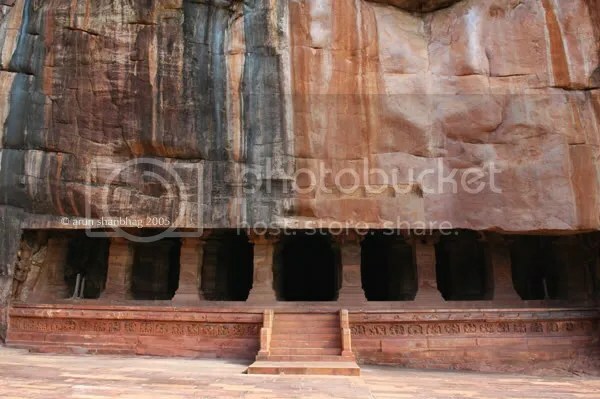 I previously shared pictures of two cave temples of Badami. These represented the zenith of the Chalukyan cave temple architecture from the 6th century. Cave one was dedicated to Shiva as the impressive Nataraja; and Devi as Mahisasuramardini. 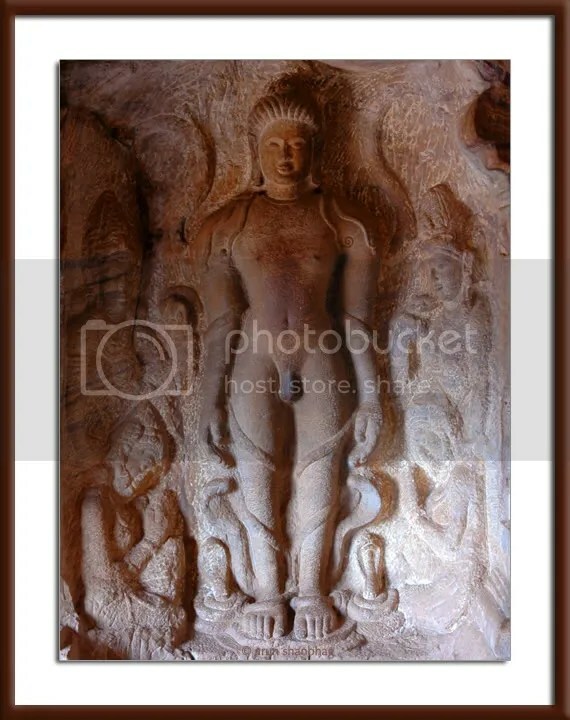 Cave two honors Vishnu and his avataars Varaha and Trivikrama (Vamana). Cave Three is also dedicated to Vishnu and his avataars, and holds some of the most impressive works of art. As we approach the caves, they appear as narrow slits in the sandstone mountain side. As you walk up and step onto the verandah that the true beauty of the sculptures becomes evident. Note that these caves are ‘open’ and have no doors or other forms of protection from the weather. Yet their grandeur has survived nearly 1,500 years. As you walk up the stairs, you step in between a row of beautifully carved pillars and on the right is the larger than life-size carving of Vishnu, as avataar Narasimha (man-lion). And what a majestic Narasimha it is. On the lower left is Prahalad, whose entreaties caused Vishnu to take this form to alleviate suffering of his devotee; and on the right is the cruel king Hiranyakashipu, who Narasimha disembowels on the threshold. was released on Ganesh Chaturthi, September 15, 2007. This was my second book. When you see both my books juxtaposed on Amazon, you will nod: yup! only a Gemini could pull this off! I am grateful that I was given this gift of compiling Prarthana in this form. With that also comes a responsibility of taking this message of our dharma to a wider audience. So I ask you to support this by purchasing a copy for yourself and your family. With the festive season of Diwali soon approaching, you may want to pick extra copies for your friends and colleagues. Prarthana makes an excellent gift! There you can also see details of the special pricing and how to buy it by credit card or check. 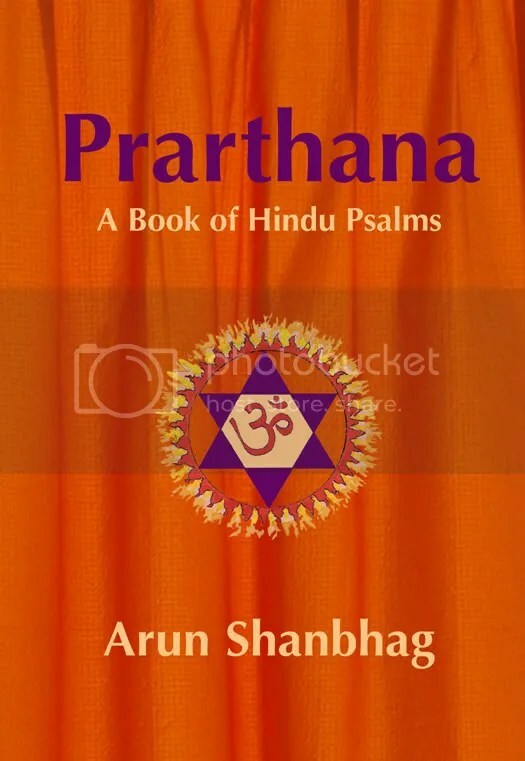 Prarthana is also available at Amazon for the List price. … these prayers speak to something common to all of humanity: a spiritual impulse for light to dispel darkness; for connection to nature, to other people, and to the universe itself; for the courage to rise above our anguish or fears, to find hope and the best within ourselves, and to share our best selves with the world. In a time of great divisions, it is heart-warming to dip into another faith tradition and find common bonds, rather than alienation. The visage of Gaṇeśa (or Gaṇapati) is easily recognizable as the elephant-headed God of Knowledge and Wisdom. Gaṇeśa is very popular in all parts of India, and amongst all sects: Vaiśnavās, Śaivās, Śaktās, Buddhists and Jainās. He is considered the controller of, and thus remover of, all obstacles (Vighnéśwar), thus he is remembered at the beginning of all religious services. 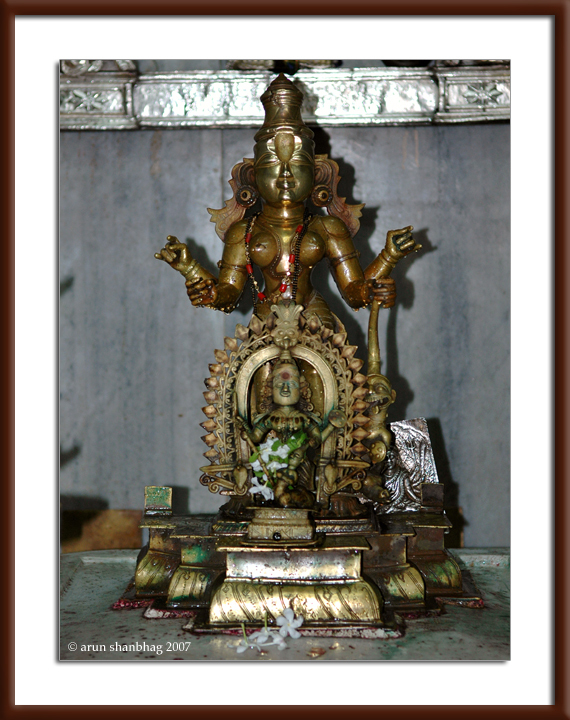 The likeness of Gaṇeśa in the form of artwork, sculptures or murtī adorn many homes and offices. Tiny Gaṇeśa figurines also grace dashboard of cars, and Gaṇeśa icons in a variety of poses is a popular gift for family and friends (from Prarthana). Badami in Northern Karnataka, was the capital of the Chalukyan empire. During the 5th to the 8th century, skilled artisans cut caves in the mountainside and decorated the insides with stunning craftsmanship. The four caves are dated to 578 CE. The first cave is dedicated to Shiva and you saw some impressive high relief figures of Nataraja and Ardhanareshwara in my earlier post. 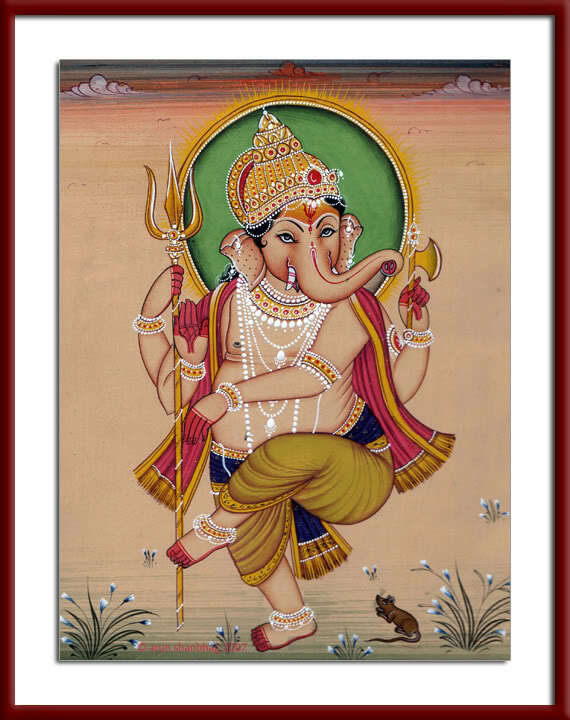 I hope you did not miss the cute Ganapati providing mridangam support for Shiva’s dance! In a prominent niche in this cave, is also housed a beautiful sculpture of Durga Devi in the form of Mahisasuramardini, which I previously used in a Dussehra greeting. Cave two is dedicated to Vishnu. Near the entrance is an impressive carving of Varaha Murthy representing the avataar of Vishnu. He is accompanied by the king Naga (lower right). He is holding goddess Prithvi, representing the earth, which he rescued from the deluge.